Sharif, who pleaded no contest in absentia, was sentenced to an anger management course, which he’s allowed to take in Egypt. As my friends, Detroit morning radio hosts Drew Lane and Mike Clark (“Drew & Mike”), asked: Do they really have acceptable anger management courses in Egypt that are legit? Well, yes. Anger management in Egypt is when you shoot just two Jews, not bomb more of them at Sharm El-Sheikh. Or when you spit in one American tourist’s salad, rather than a whole family. Or when you edit your normal greeting to simply, “Death to America,” rather than your usual, additional inclusion of “Death to Israel.” Or honor killing your sister and not also your wife. But, seriously, do they really have anger management courses in Egypt as taught by the Al-Ikhwan Al-Muslimeen (Muslim Brotherhood)? Or at Hate U–Al-Azhar University a/k/a Al-Azhar Al-Sharif? Doubtful. Great move on his part…thought he was dead! Guess he won’t have to do “Celebrity Cop 2” now. Omar was so mad he just BLEW UP! Not lterally though, you have to be trained to actually BLOW UP. Gee, imagine what sentence he would have received if he wasn’t an Egyptian muzlum (he converted to Islam in the 1950’s after marrying Egyptian acress, Faten Hamama) for using that pejorative when describing the Guatemalan and attacking him. Had “whitey” done that and broke the guy’s nose, he would’ve been charged with assault, battery, breach of peace, public intoxication, hate crimes, and counterfeiting – then sentenced to 15 years in prison, mandated anger management courses, had to pay the Guatemalan $5,000,000! BTW, that’s the first time I ever heard a Guatemalan using the name “Anderson”. No doubt he’s an illegal using an assumed Anglo name. Anyway, “Anderson” will get chump change at the civil trial because, although illegal aliens are a protected species, Egyptian muzlums are “more protected”. So, my advice to Anderson is to wait until the check arrives in the mail before stocking up on tortillas. “Hate U.” That’s pretty funny. Why wasn’t Mr. Sharif arrested for assult, and battery at the time this incident took place? And why was he given such a light sentence? Is it because he’s a “movie star”? Or a Muslim? Are there any Guatemalans named Kawalsky? Or Rubinstein? Just wondering. Bad boy of the internet, who some have called the Dave Chappelle of blogging, EminemsRevenge tells it like it is! Yeah, whitey never gets away with flagrant racism. Pity Mel Gibson isnít white. At least the Mel Gibson fiasco made world news, he was hauled out in front of his accusers, and made to apaologize. 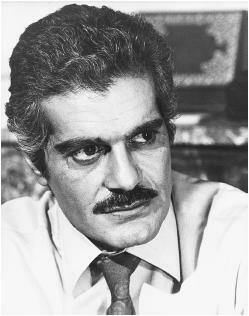 Omar Sharif’s prejudiced crimes were swept under the rug because he’s a member of a protected species – he’s a muzlum. Nice try, you LIBERAL scumbag! hey debbie… do you ban people for sexism? or does thee_bruno get an exemption? I suppose he’s old and he just feels like crap all the time. When he was in LA he probably had jet lag on top of it. I hope I don’t feel that bad if I live that long.